A groundbreaking emergency services partnership, which helps to save lives and resources, has swept the board at the Gwent Police Awards. The Joint Response Unit (JRU), operated by the Welsh Ambulance Service and Gwent Police, sees a Paramedic and a Special Constable attending incidents such as assaults and road traffic collisions together, to provide medical assistance and free up their colleagues to help others. 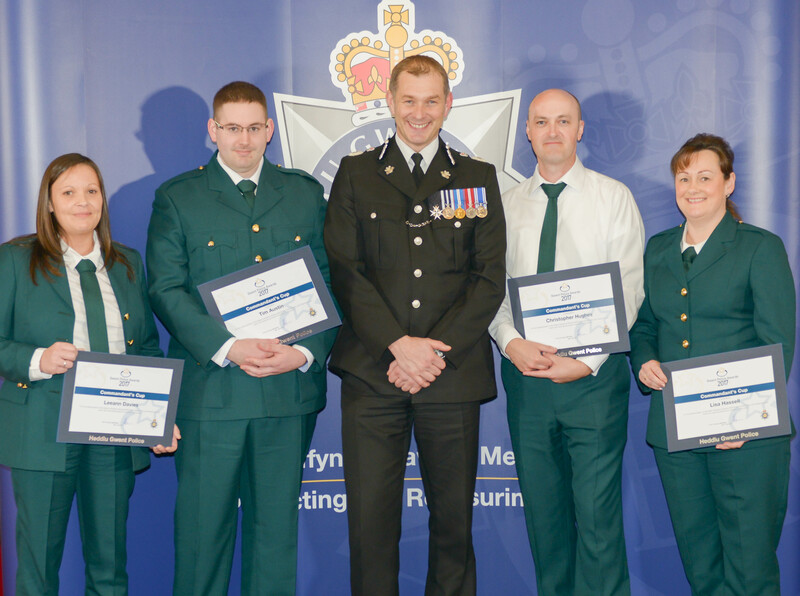 Their work was recognised at the police force’s annual awards ceremony held at the Celtic Manor Hotel. The team of five paramedics and 10 Special Constables were awarded the Commandant’s Cup for Joint Working. There were also two awards for Welsh Ambulance Service JRU Project Lead Chris Hughes, who spearheaded the initiative after witnessing a similar operation involving London Ambulance Service and the Metropolitan Police. Chris received a Chief Constable’s Commendation after responding on the JRU to help save the life of a man, who was stabbed in an unprovoked attack in Caerphilly last year, as well as the Folley Shield for his positive contribution to the work of the special constabulary. Chris said, “It’s fantastic that the team has been recognised in this way and it is very much a team effort between us and the police. We have Special Constables on board who man the police radio, know the terminology, and can help us to communicate with police officers at the scene of incidents. By picking these calls as they come in, as paramedics we’re also able to arrive quickly to provide timely medical assessment and treatment. The JRU was originally launched in July 2016 after it was found that between October 2015 and March 2016, the two emergency services attended 2249 incidents together. Under the scheme, the team in a specially marked vehicle carry out shifts covering the Aneurin Bevan Health Board area, self-selecting appropriate 999 incidents via remote access to calls coming into local control rooms. During its first month, members of the response unit attended 72 incidents and only required back up from an emergency ambulance on 15 occasions, while the Trust’s Urgent Care Service also provided support five times. This enables ambulance crews who would normally attend to respond to members of the public facing potentially life-threatening emergencies elsewhere in the region. Their attendance also means that police officers at the scene are made available to move on to other cases when appropriate. Currently the team works three 10-hour shifts per week on a Friday, Saturday and Sunday, when the emergency services often experience their highest demand. Each member of the Special Constabulary team has been given additional training by the Welsh Ambulance Service so that they can assist paramedics with medical incidents.